Terrain: Old-growth Pacific Northwest forest! Lots of ferns and fir trees. Difficulty: Mostly flat, with some small hills on the southern end. Well maintained and easily accessible at multiple trailheads. Water: No reliable water sources in summer and fall, other than Balch Creek on the southern end. 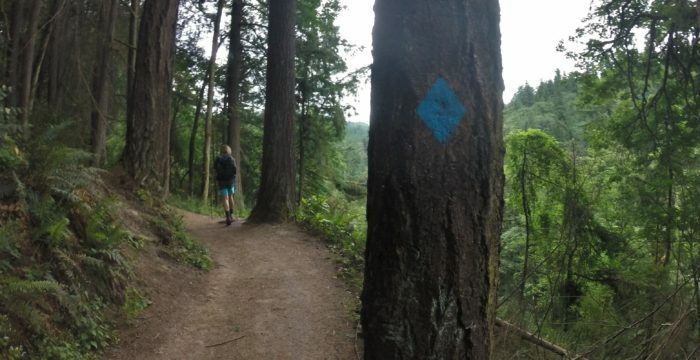 If you’ve ever visited Portland Oregon, you’ve probably noticed that there are miles of undeveloped hillside along the Willamette River, just north of the city. That awesome ridge is Forest Park, a giant urban forest (5,157 acres, to be exact). There are over 80 miles of trails in Forest Park, but the longest trail in Forest Park is the Wildwood Trail. It is a National Recreation Trail with a total length of 30.2 miles. It is charmingly marked with blue diamond blazes on towering fir trees. 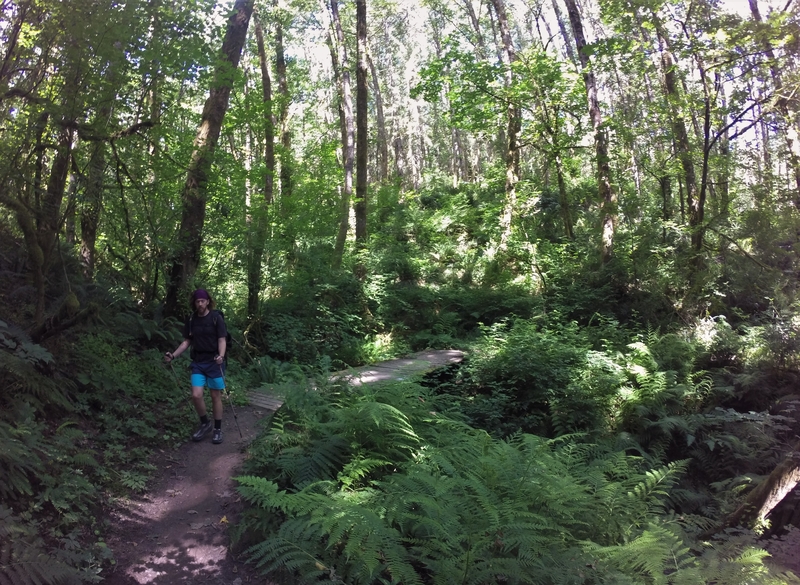 Ever since moving to Portland, Limbo and I have wanted to hike the Wildwood Trail, end to end, in one day. Before thru-hiking the AT, we thought doing it all in one day would be impossible. Then we hiked 2,000+ miles, and our perspective changed a little bit. So, earlier this summer, we decided to take on the Wildwood. We only punished ourselves into hiking one ~30-mile day on the trail, so I still approached this undertaking with some healthy respect. A lot can happen in 30 miles! Preparation for this hike is pretty minimal. This is a very well marked and very well traveled trail with cell phone reception the entire route. It’s a fairly flat trail with some elevation changes in the southernmost 5 miles. We didn’t have day packs big enough to hold all our food and water, so we used our trusty ULA packs that saw all 2,189 miles of the AT. It definitely felt like overkill. I also may have gone a bit overboard with food. While I do not miss the days of Clif Bar breakfast and instant mashed potato dinner, I did approach our trip to the grocery store with the enthusiasm of a thru-hiker. Snickers? Check. Potato chips? Check. What can I say, hiking brings out my junk food junkie. We got to the southern terminus around 5:30 AM. We forced our pitiful trekking poles to extend after months of post-AT disuse. We took a picture at the southern terminus. And we started walking. 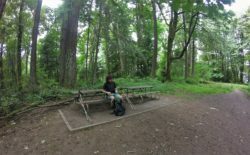 Forest Park is a sanctuary of ancient moss-laden trees, winding along the side of ridges with ferns and wooden bridges over small washes that host beautiful streams in the spring. It’s easy to take for granted because there aren’t big “payoff” views. It really is a green tunnel, reminiscent of the AT. But there’s something so peaceful about it. The highlight was a beautiful barred owl that observed us from its perch for minutes before silently flying away. We talked and laughed and remembered how great it is to just be in the woods. After the first few miles settling in, I felt like my body found the rhythm it knew for 4.5 months – just putting one foot in front of the other. About 11 hours after we started, we completed our one-day thru-hike. At least 8 other people were completing the end-to-end hike that day, and several others finished within a half hour of us. All I could think about was how unsatisfying it was to be done. My body ached and my feet were swollen, but I craved more. I wanted to be waiting for a hitch into town, not just going back to our apartment. I wanted to swap stories with fellow hikers, but we didn’t have months of experience in common…only half a day. I wanted to eat a milkshake, hamburger, pizza, and french fries without any guilt, but one day of hiking doesn’t quite justify that. The feeling I felt most while waiting for our ride that afternoon was the pang of remorse for another beautiful experience coming to an end. I think everyone can relate to this feeling- Coming home after a great vacation. Re-visiting your alma mater after years. Trying to catch up with a dear friend in way less time than you need. It’s the feeling of nostalgia and wishing for more time. But we can’t lose sight of the amazing experiences we are getting to have, just because leaving them is hard. I’m grateful that I am physically able to hike, and that I live in a place with abundant opportunities to have similarly breathtaking experiences. The best thing I know for combating the blues is just to keep looking forward and finding new trails. 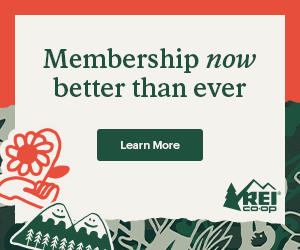 For more information about Forest Park, check out The Forest Park Conservancy. Feature image courtesy of Robert Tuck via Flickr. Oh man. You know about Skyline Tavern, right? You can hike there, it’s just a short detour up to Skyline Drive from the Wildwood Trail, or it might have been a nice approximation of a “trail town” feel for dinner after your hike. The arts ensemble that owns the tavern actually leads hikes through Forest Park pretty frequently as well. Anyway, it’s one of my favorite places in Portland. I still stand in awe of the people who can crank out 30 mile days. ONCE on my trek, I hit 20 miles, and that was a celebration milestone, believe me! I suspect the ability to do 30 in a day lies somewhere back in my misty past when I was much younger. Hey, even 20 miles is respectable! Just getting out and going for it is an achievement in my book.